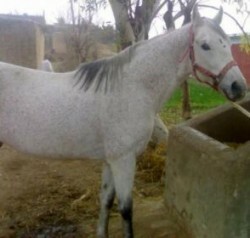 According to Pakistan's Agricultural Department, the original stock of the Hirzai breed is said to have been derived from a mare owned by the Rind chief named Shol, by an Arabian stallion belonging to a European military officer who accompanied the contingent of Shah Shujah al-Mulk through Shoran in the first Anglo-Afghan War of 1839. Representative animals are still owned by His highness Suleman Dawood Khan of Kalat. The predominant color of the Hirzai is gray or white. The head is handsome with a broad forehead; the neck is medium in length, muscular, and arched; the body is compact with a short back and well-muscled loins; the croup is level; the shoulders are well sloped and powerful; the forearms are strong, but the legs lack bone. This is a horse of strength, good conformation, and stamina. It usually stands around 15 hands high.